BLAINE, Minn. (July 16, 2017) – Champions were crowned in 26 divisions of the Schwan’s USA CUP Weekend Tournament Sunday, July 16. After a day off on Monday, Schwan’s USA CUP will resume on Tuesday, July 18. The Opening Ceremonies will be held at 7:30 Tuesday evening. The ceremonies will feature the Leap Frogs, the U.S. Navy parachute team. This year’s tournament features 1,168 teams from 17 states and 15 countries, making it the largest youth soccer tournament in the Western Hemisphere. The weekend and week-long tournaments together will generate an estimated $33 million in economic impact. Devon Hoier of the Thunder Bay Chill dribbles the ball, as teammate Marcus Micelli and Rubeckianska defender Michel Diab give chase. The Chill beat the Swedish side 2-0 in the boys 19 championship game. Five Minnesota clubs won titles. The Rochester Youth Soccer Association, Minneapolis United, Eden Prairie Soccer Club, Sporting St. Croix and Minnesota Thunder Academy each captured a championship. Other U.S. states winning championships were North Dakota (3), Wisconsin (3), Illinois (2), Nebraska (1), and South Dakota (1). Teams from Ontario, Canada won five titles, including an impressive three championships for the Thunder Bay Chill. A Manitoba team also won a championship. 11 Boys A flight: Croatian Eagles 06 Red, Franklin, Wis. 3, Broomfield Blast SC Prestige, Broomfield, Colo. 1. 11 Boys B flight: Magic Soccer FC, Bismarck, N.D. 3, Blaine Blaze, Blaine, Minn. 0. 11 Boys C flight: Valladolid USA Purple 06, Pingree Grove, Ill. 7, Edina SC Black, Edina, Minn. 0. 11 Girls A flight: Polonia SC 06, Franklin, Wis. 2, REV SC Academy, Rosemount, Minn. 0. 11 Girls B flight: RYSA Thunder, Rochester, Minn. 3, Minot Magic FC, Minot, N.D. 1. 11 Girls C flight: Minneapolis United Warriors, Minn. 1. Bloomington Youth Soccer, Minn. 0. 12 Boys A flight: Club Deportivo Guadalajara, Guadalajara, Mexico 6, Colegio Santo Americo, Sao Paulo, Brazil 0. 12 Boys B flight: Lincoln School, Heredia, Costa Rica 2, WSEU Red, Winnipeg, Manitoba 0. 12 Girls A flight: Croatian Eagles Red, Franklin, Wisc. 3, Woodbury SC Academy Blue, Woodbury, Minn. 1. 12 Girls B flight: Mitchell Ravens FC, Mitchell, S.D. 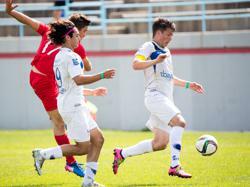 6, FC United, Cedar Rapids, Iowa 3. 12 Girls C flight: EPSC Peltier, Eden Prairie, Minn. 4, Lakeville Wolves, Lakeville, Minn. 2. 13 Boys A flight: Sporting St. Croix, Stillwater, Minn. 2, Kickers United FC, Elgin, Ill. 1. 13 Boys B flight: Beijing Zhongguanchun United, Beijing, China 2, REV SC South Black, Rosemount, Minn. 1. 13 Girls A flight: Oshawa Kicks, Oshawa, Ontario 5, Thunder Bay Chill, Thunder Bay, Ontario 0. 13 Girls B flight: FC Lake County Black, Grayslake, Ill. 1, Valley United Red Devils, Apple Valley, Minn. 0. 14 Boys A flight: Club Deportivo Guadalajara, Guadalajara, Mexico 8, REV SC Academy Black, Rosemount, Minn. 1. 14 Boys B flight: Magic Soccer FC, Bismarck, N.D. 4, Bonivital, Winnipeg, Manitoba. 3. 14 Girls A flight: Thunder Bay Chill, Thunder Bay, Ontario 1, Club Deportivo Gol Star, Bogota, Colombia 0. 15 Boys A flight: MTA 2002, Twin Cities, Minn. 2, SSC Diablos 02, South Sioux City, Neb. 1. 16 Boys A flight: Caledon FC 01, Toronto, Ontario 3, Thunder Bay Chill, Thunder Bay, Ontario 2. 16 Girls A flight: DUSC, Bismarck, N.D. 1, Waunakee Purple Rockets, Waunakee, Wis. 0. 17 Boys A flight: Lincoln Aztecs FC, Lincoln, Neb. 3, Hartford United SC Black, Hartford, Wis, 1. 17 Girls A flight: Bonivital Flames, Winnipeg, Manitoba 1, NLS Strikers, Anoka, Minn. 0. 19 Girls A flight: Tokiwagi Gakuen High School, Sendai, Japan 4, Fire SC, Twin Cities, Minn. 0. ©2019 USA CUP International Youth Soccer Tournament / SportsEngine. All Rights Reserved.